The 1978 Cheoy Lee "Antares" is a beautiful example of the Ray Richards designed Offshore 41, built by the reputable Cheoy Lee Shipyard. 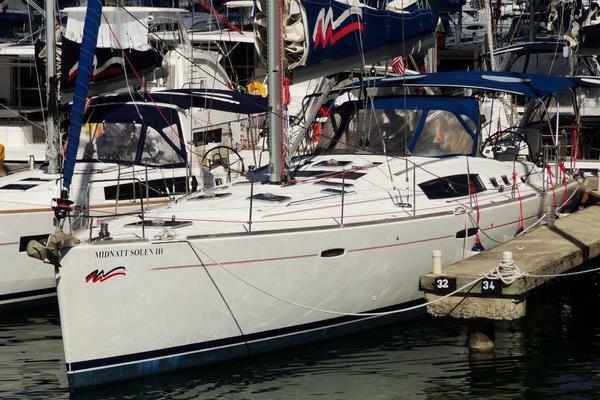 This vessel has seen many improvements and systems upgrades that make her really stand out which include a new Westerbeke 44C diesel, hydraulic transmission, propeller shaft, cutlass bearings and dry exhaust all in 2014, not to mention a new mainsail in 2015. The owner will consider smaller sailboats in trade. "Antares" has classic lines that make her stand out on any dock. The beautiful woodwork both inside and out make her very unique. As you go down the companionway there is a private double stateroom to starboard with hanging locker and drawer storage. To port there are also two quarter-berths and forward facing navigation station. Moving forward on the portside is a very complete u-shaped galley with overhead cabinets. Opposite to starboard is the head compartment that also opens into the aft stateroom. Forward of the galley is a roomy and very unique salon with circular seating on both the port and starboard sides plus a very nice drop leaf centerline table that is large enough to accommodate the whole crew. Table drops down to form a queen/king bed. Forward is a second private stateroom that has a staggered bunk arrangement with ample storage.